Anytime you light a candle for a magickal purpose, you can divine the wax, flame, and smoke patterns to interpret your answers. One simple but effective methods is to assign the candle right and left sides the correspond to yes and no. If the candle drips first to the left and you assigned that side to no, then your answer your answer is no. Other methods call for watching the flame dance or the smoke spiral in a direction. If it dances to the west, you must watch your emotions. If it dances to the east, you must use your mental processes. Likewise, if it dances to the north, you will face a physical task, and if it dances to the south, you will have an intense experience of success. If the flame burns high and strongly, the magick is working quickly and will be successful. If it is burning low and almost smothering itself out, you need to cleanse the entire area, including yourself, and rework the spell. If the flame is crackling, it means the magick has encountered opposition. If it burns mostly blue, it means you are connected to the divine. If it is sparking, it means to expect company. If the soot around the candle turns the glass very black (like in a novena), it is thought to mean that someone has been thinking ill of you. A cleansing of the area should be performed. 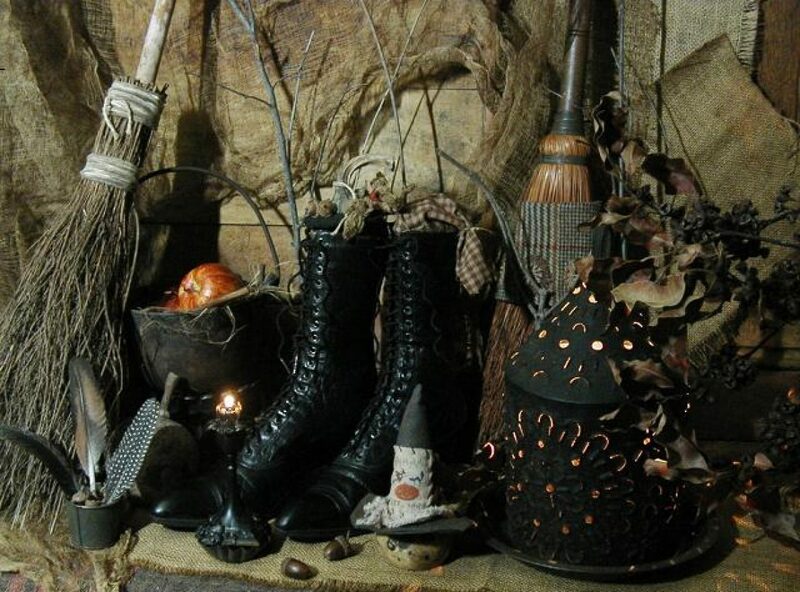 If the black soot is only around the top edge of the novena, it means that the magick has encountered opposition and may take a while to take effect. If the smoke spirals toward you, the spell will work quickly. If it drifts away from you, you will have to persevere in order for your wish to be granted. Some schools of thought teach to never blow out a candle flame, because it is rude to the elemental spirits of the fire. Others teach never to pinch them out. Likewise, some teach to never use matches and others say to use only matches. These are things you should decide for yourself, also, when employing candles for magick, always allow them to burn themselves out, if possible. Fire magick is dramatic, entrancing, and magnificent. Fire Witches have a distinct preference for the more challengiing magickal tasks and full-fledged rituals. However, there are many simpler way to use fire magick. Always follow common sense safety rules when working with fire. Primary to fire magick is the simple art of candle magick. When using candle magick, select a candle color that corresponds to your intent. There are many charts giving versions of candle correspondences, but te key to effective candle magick is to choose a color that you think suits the task. It’s best to search for your own set of color correspondences. If you end up using a recommended color that doesn’t calm you (if that is what is called for in the spell), how will it work to calm the universe? 1. Cleanse and consecrate the candle to the four elements. 2. Bless and anoint the candle with an appropriate oil. 3. Channel your magical intent into the candle. You may wish to bind it there with a ribbon or thread. Hair (even though it smells horrible when burnt) works very well to bind intent. You can carve symbols into the wax to further seal intent. 4. Light the candle. The flame releases the energy you programmed into it out into the universe to bring the desired change. Herbs are often used in conjunction with candles to provide a little extra tra oomph. Specialty candles can also pack a powerful magical punch. Practitioners of Voodoo, Hoodoo, and Santeria make use of these in magic and in offerings. The myths of the phoenix came about due to the natural solar eclipses and humanity’s inability to explain them in the past. The amazing part of these myths is that during an eclipse, one can see the pattern of the wings in the sun’s corona. The phoenix was called the bird of the sun. The ancient Egyptians considered the phoenix to be an avatar of the sun god. When his life was over (which was originally estimated at 500 years and went up close to 100,000 years in later times), he would light himself on fire, only to be reborn from the ashes after a suitable resting period (also around 500 years). It was said that the fire smelled of cinnamon. The spirit of the bird wraps its nest in myrrh and sacred leaves and molds it into the shape of an egg. It carries the egg to the temple of the sun god and flies away for its rest. The phoenix was described as red and yellow, with a purple neck, and was considered the most magnificent bird. Only one phoenix was allowed to live at a time. Not only could the ashes give renewed life to the phoenix, but they were reputed to bring humankind back from the dead as well. One emperor peror even dined on a bird of paradise as a substitute for the phoenix, hoping to achieve immortality, but he was murdered shortly after. Ovid stated that the phoenix ate only frankincense and other odif- erous gums. It was further speculated by others that the phoenix hid from humankind intentionally. The phoenix spans almost all mythologies and is a much-loved symbol of everlasting life. It is seen as a sign of peace and prosperity. Lightning is a manifestation of fire in the air. Wielded by the gods as both a weapon and a messenger. lightning is nature’s fireworks. It is our basis for electricity. Folklore relates that lightning never strikes in the same place twice. However, this is simply untrue. The Empire State Building was struck no less than sixty-eight times in a three-year span. Park rangers Roy Sullivan from Waynesboro, Virginia, holds the world record for being struck by lightning more than any person in history. Between 1942 and 1983 he was struck an astrounding seven times. The ancient Romans thought that a lighning bolt striking from left to right was a sign of good fortune. If the bolt passed from right to left, it meant the gods were unhappy with current events. It was believed that examining sites where lightning had struck would reveal lightning stones. Lightning stones are the small ax-shaped stones also called thunderstones and are thought to hold the magical properties of lightning. Temples were often erected on these sites, as they were considered sacred. In various parts of the world, lightning is thought to take on the physical form of a bird. In some places this lightning bird is called the “bird of heaven.” It is described as iridescent. If you see a flash of lightning, it is because the lightning bird has just darted across the sky. It is thought that if you destroy the nest of this bird, there will be a great storm. In general, taking any negative action against this bird is inviting misfortune. It is said that no person has ever succeeded in harming this bird, as it moves too quickly. Lightning is predominantly thought to be born only from the sky, but in actuality it is the combination of a positive charge from the ground surging upward and the negative charge of the lightning surging downward that creates the electrical charge of lightning. Lightning strikes both ways. Often, when lightning strikes the ground, it will fuse the minerals underneath into a rock formation. So the eggs of the lightning bird and Chango’s stones do indeed exist. The minerals present in the soil vary from region to region and determine the rock produced. When lightning strikes sand, it fuses the grains together to create natural glass. Also known as the northern lights, the aurora borealis is nature’s primary light show. It is described as beautifully colored mists that weave and dance their way across the skies. These stunning lights are shared between fire and air, but are listed under fire because no light would exist if not for fire’s eternal source. The northern lights are actually a gathering of solar-charged particles attracted to the Earth’s magnetic pull, but the Vikings believed the lights to be the spirits of dead maidens dancing. This belief crossed cultures, and the Native American tribes that lived in the extreme north also associated these lights with the realm of the dead. They believed that they could call these spirits forth by whistling. In ancient times, some people were afraid of the lights. They saw them as ominous portents of war or famine. They thought that when the lights appeared, it meant the gods were angry. Will-o’-the-wisps are the earthbound lights that guide travelers away from safety to walk along treacherous paths. They can be considered malevolent, and in the past were often thought to be the souls of the dead. They tend to appear on swampy lands and near graves. Will-o’-the-wisps are most often described as floating orbs of light that can move about quickly. They have been reported in a wide range of colors. Many who experience the phenomenon say that the light mimics their movements and pace. Currently explained as a glowing type of swamp gas, will-o’-the- wisps continue to make their presence known in various parts of the world. They are also called ghost lights, spooks lights, corpse candles, foxfire, fairy lights, and peg-o’-lanterns (or jack-o’-lanterns). In North Carolina, at Brown Mountain, these lights are particularly active. The first recorded encounter with these mysterious lights was in 1771, by a German engineer. Later accounts related that these lights would chase travelers along the trails. Of all of nature’s eerie lights, the will-o’-the-wisps are the only ones credited with actually following people and having a seemingly coherent thought process. In Irish folklore, the will-o’-the-wisps are described as being quiet and helpful. They appear in order to warn one of possible bad health for family members or loved ones. While scientists say that will-o’-the-wisps are burning balls of swamp gas, they are known to be cold. They have also been reported to move against the wind, something a real gas cloud could not do. They have also been called “ball lightning” and are said to explode and crackle with energy. Ball lightning has been credited with causing deaths. In 1638, ball lightning struck a church in Devon County in the United Kingdom, subsequently killing four people. Often, ball lightning disappears as quickly as it appeared, leaving witnesses bewildered. Sometimes, an explosion is heard just after the light disappears. St. Elmo’s Fire, on the other hand, is seen as a benevolent force of nature that guides sailors through treacherous areas and signals the end of storms. It is said to be the dead spirit of St. Erasmus returning to aid the sailors. St. Elmo’s Fire is actually a form of atmospheric electricity that appears during stormy weather.